This meal is actually from the other night…but I never got around to posting it! I’ll post tonight’s Veggie Pizza recipe tomorrow when the boys are having leftovers. Then we’ll be back on track! 4 corn cobs ($.60) On sale at Walmart for $.15 each last week…and at Kroger for $.17 each this week! 2 cups mashed sweet potatoes ($.79) Prepared and frozen with sweet potatoes from Easter week sale, like I did here at Thanksgiving! In small bowl, whisk mustard, honey and vinegar in small bowl. Place chicken breasts in shallow dish and pour marinade over the chicken. Let marinate for at least 30 minutes in the refrigerator. Grill chicken about 8-10 minutes each side, until cooked through. Cooking times may vary depending on the thickness of the chicken and the heat of the grill. Prepare and grill corn, as indicated here. Cook and serve mashed sweet potatoes, as indicated here. 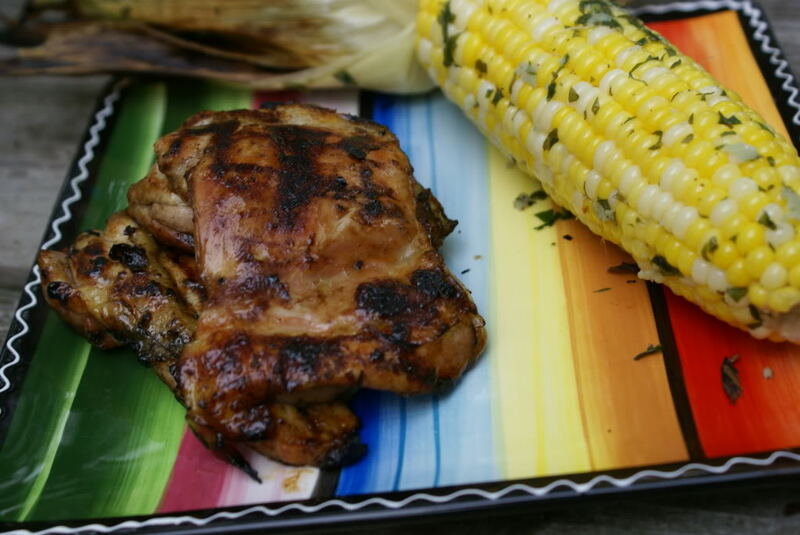 Serve Grilled Honey Mustard Chicken with Grilled Corn and Mashed Sweet Potatoes.